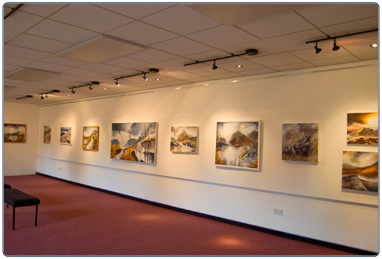 Our Gallery shows various exhibitions throughout the year. These change monthly and we include a far reaching variety of mediums and subjects in our programming. Entry to the Gallery is free and is open from 10:00am-8:00pm, 7 days a week. Our upcoming exhibitions are listed on our Events Brochure. We have an excellent reputation for our diverse range of arts courses. We run a dynamic programme of classes and activities to suit all ages and abilities. Our Studio Theatre is available to hire for performances. It can accommodate up to 108 people seated theatre style, 140 people standing and up to 56 people in cabaret style. We can provide full technical support for your production or band night. The Studio can also be hired for private parties and functions. Our Meeting Room is an ideal space for meetings and presentations. The capacities are 15 board room style, 16 in workshop style and 20 theatre style. For further information on room hire and charges please contact the Box Office. To enquire about this venue with no obligation to book, please complete the Venue enquiry form. Alternatively, please contact East Kilbride Arts Centre. This table contains information on the capacity of the rooms and halls at East Kilbride Arts Centre. Access: Two accessible parking bays. Wheelchair access to lower floor (including café). Upper floor access via lift. Wheelchair users have to notify at time of booking. Induction loop. Accessible toilets are available on the ground floor.